Launch your online loyalty system on the automated Say2B platform in just 2 minutes! It helps to increase the number of orders by an average of 32%. Why you will love Say2B? Customers who like rewards and points usually spend much more - now you can help them earn more and they will bring you more money! Multi-location support. All your locations and places under the same brand share a single loyalty system in Say2B. Send push notifications or emails to your customers or other registered users! Contact customers 24 hours a day, 7 days a week - send push notifications to your customers' phones! Send emails in just a couple of clicks. Target a specific region, people of a given age and gender, etc. You can send messages to your customer base only as well as to all Say2B users who match the parameters you specified. Use gifts, points, holiday greetings to increase the number of repeat sales and increase your average check size. We also care about your guests - they can participate in your loyalty program even without going to the trouble of installing the application, just by entering their email. And that’s all you need to be always in touch with every client of yours! Communicate with your customers: gather feedback, ideas and issues and respond to them. Our system has more than 10,000 institutions. All your locations and places under the same brand share a single loyalty system in Say2B. We’ve already been using the app for 4 months and saw an increase in the number of customer visits, customer engagement and our revenue of 34%! And it was really easy to get started - the interface is clear, customer support is brilliant. Say2B makes us look a bit more professional to our guests and we don’t need to pay much for it at the same time. Overall, we like it and are waiting for new features to come and integration with our POS. Great job, guys! We started with a free format. It took us less than 2 hours to set everything up! And the best thing is that our customers immediately took to earning points on their phones so much. Almost half of them return to us several times a month so we’ve upgraded our plan to have access to more opportunities. Highly recommend this app for small business! 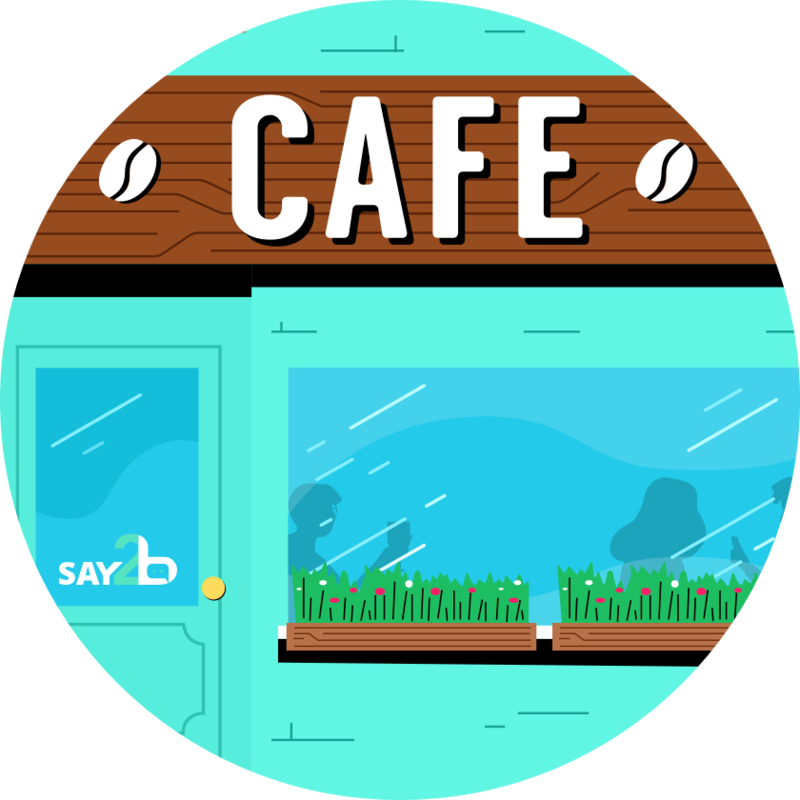 I tried several apps and chose Say2B for its pricing, speed and simplicity. We can reach our clients in seconds via push-notifications and we don’t have to make them use the app, if they aren’t doing this yet - just take their email. We’ve had some minor issues at the beginning, but they fixed it quickly. The company is always ready to take suggestions to improve the app. Do our customers have to install Say2B on their phones? No, they do not, but you would have more engagement with customers, who have our app on their phones. In any case, you will be able to give & withdraw coins / gifts & discounts. Write them messages and etc. Do we need any additional equipment to use Say2B? How much time does it take to set everything up? Do you offer branded application for our business? No, users don’t want to install separate application for each business they interact with. Say2B aggregates all of them in one place. What do I do with the existing plastic loyalty cards I have? Want to know more about our loyalty platform Say2B? The statistics show that you can earn much more on returning guests. Our platform gives you all the tools you may need to achieve this. Many of our clients without much experience in technology told us that our loyalty platform is very easy to use. You can start working with it for free in just several hours! Our main goal is to become the best loyalty program for cafes, restaurants, shops, hotels and other small business. That's why we also care about your guests and our clients - getting them signed up only takes a few seconds. Our loyalty platform allows small business to sell more without any special knowledge in IT or other areas of technology. You will easily maintain a constant dialogue with your customers - even if you receive a bad review, you can respond to it first and take some simple steps to solve issues before it goes out and other customers know about it. Using Say2B templates, you can create any loyalty program for your business, from giving your customers points or presents to using referral promotion. We collect all the interesting cases and can give you advice as to which promotion better suits your purpose in this or that case. Try it once for free and you will love it!